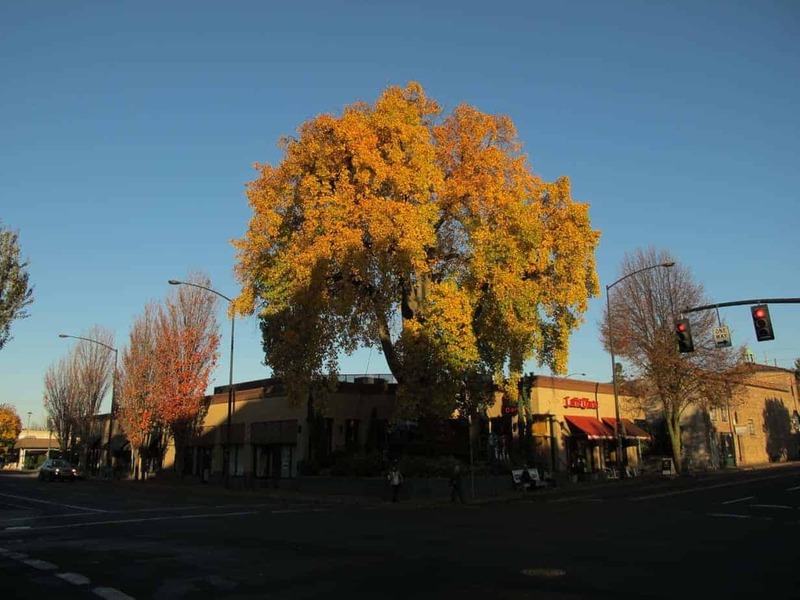 Comments Off on Portland Heritage Tree #3 – Tulip Tree, NE Weidler Ave. I love asking people if they know about the Portland Heritage Trees. Usually they say no, and then I ask if they have ever seen a really cool tree with a plaque on it. And then they usually say yes. “That’s a Heritage Tree,” I tell them. Or sometimes I’ll just ask them about a particular tree, such as: “You know the corner of NE 15th and Weidler, where there’s a little coffee shop across from Grand Central Bakery and Umpqua Bank?” They think about it for a second, then nod. “Okay,” I say, “you know that really big tree there?” Then they perk up and say “Yes! That tree is amazing!” When I tell them it’s a tulip tree, they’re even more amazed. 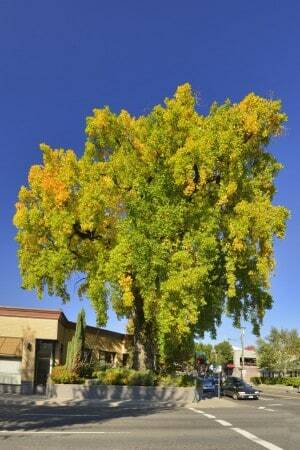 Portland Heritage Tree #3, Tulip Tree, in autumn. 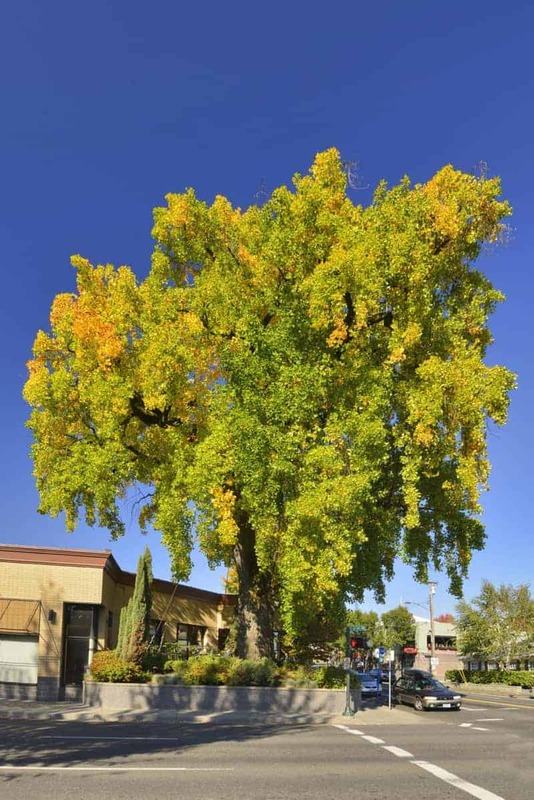 The fact that this tree was one of the very first Heritage Trees dedicated by the Heritage Tree Subcommittee in 1993 should tell you something. Think of your average tulip tree. Now think of this tree, and its awesome size. 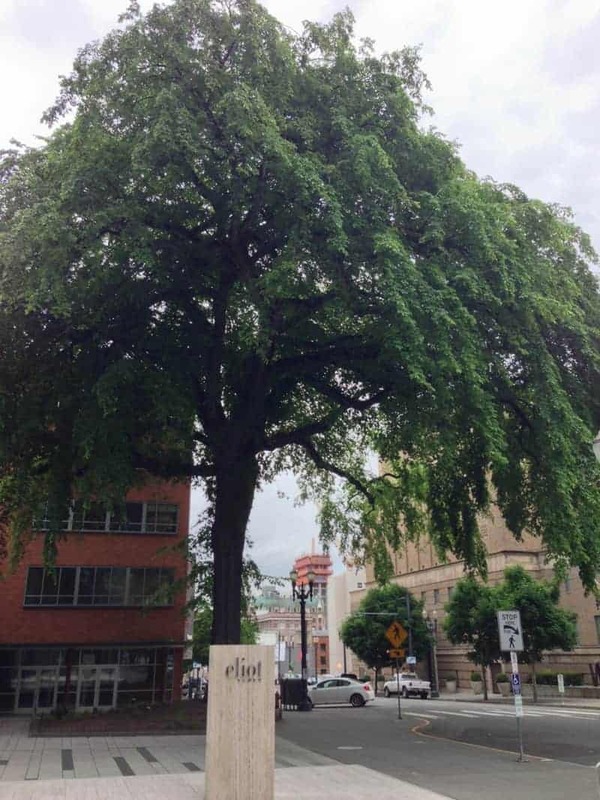 According to recent inspections by the city’s Urban Forestry Department, it stands 60 feet high, with a diameter near 6 feet and a circumference of 15.4 feet. 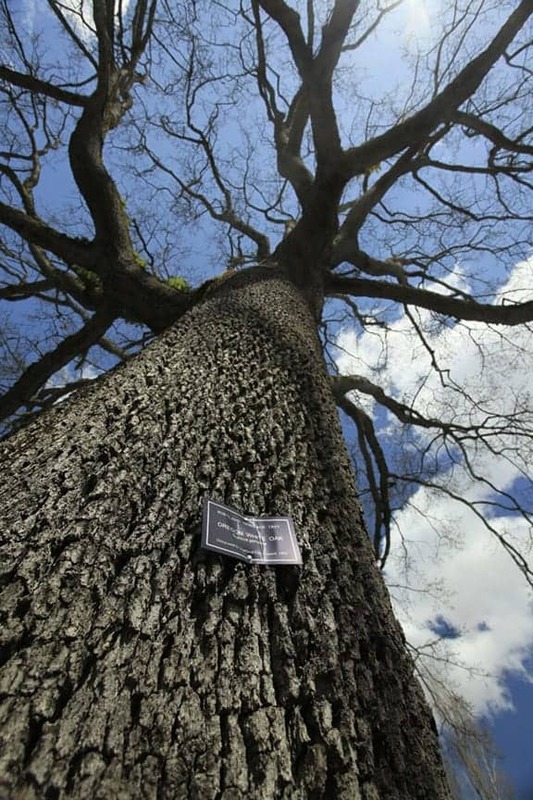 Its spread — the area covered by the widest branches — is estimated at 64 feet! According to documents in city files, the land was part of an 1870 deed to George M Weidler, and the tree was planted by George Nicolai shortly after building a house on the property for his bride in the late 1880s. (So you’re looking at about a 125-year-old tree!) A 1974 note in the file mentions a Mrs. Chester Stipe, who says she was born in the house 1898 and remembers the tree as a young sapling. Some work was done by a local arborist, and a 2013 inspection remarked, “Continuing slow dieback in outer crown … general vigor appears fair. Existing crown dieback not significant enough to be hazardous.” They also recommended removing at least one cable. 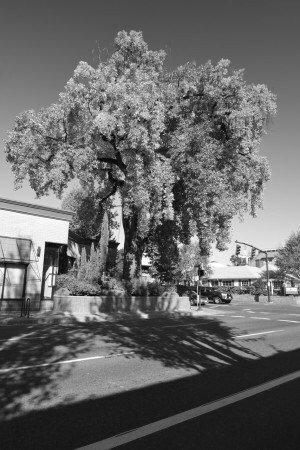 It’s trees like this that inspired me to write my guidebook to the Portland Heritage Trees. That research is ongoing — and you can read additional Heritage Tree posts here — but meanwhile this tree continues to give me inspiration. First there is just its magnificent presence, and its survival through all the city being built around it. But the main reason I love these trees is that it inspires those “aha” moments in people. Aha to that big tree I’ve always noticed, but never stopped to consider. Aha that it’s a damn big tulip tree! Aha that the people who planted it and grew up under it are some of the great names of our city. And aha that there’s a whole program to protect and preserve trees like this. So, next time you’re around the corner of NE 15th and Weidler, take a moment to enjoy, admire, and contemplate. Author Paul Gerald also writes about hiking, breakfast, travel and spirituality. He has written five books and offers great talks and trips.